Supreme Court To Hear Chicago Gun Rights Case At issue Tuesday will be whether the Second Amendment right to bear arms puts the same constitutional limits on state and local laws as it does on federal laws. The city of Chicago contends that states and local governments should be able to enact regulations that they deem best for their communities. 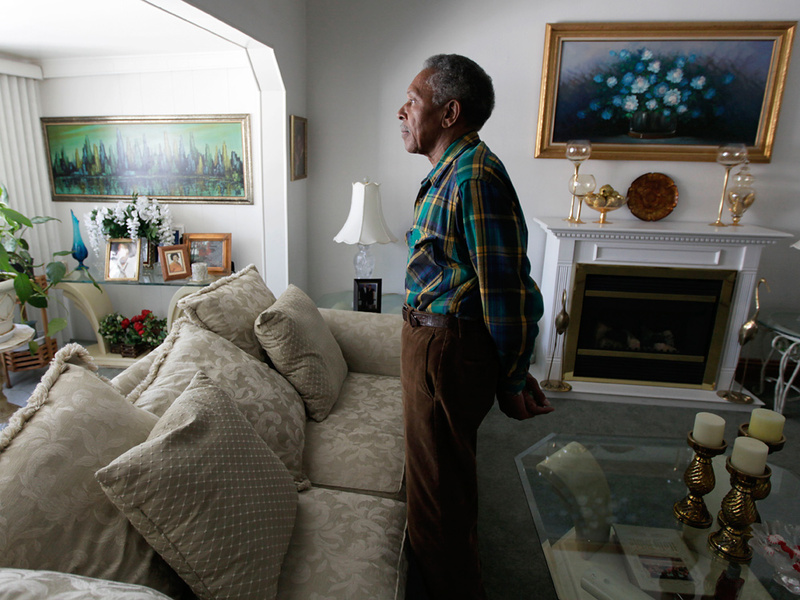 Otis McDonald says his home on Chicago's South Side has been broken into three times. McDonald's desire to own a handgun led him to sue the city. The U.S. Supreme Court steps back onto the firing range, so to speak, as it takes up the controversial question of gun rights Tuesday. At issue is whether the Second Amendment right to bear arms puts constitutional limits on state and local laws as well as federal laws. For the first 100 years of America's history, the Bill of Rights — protecting rights of free speech and religion, among others — limited only what the federal government could do. The states had a much freer hand to act as they wished. That changed with the Civil War. Amendments enacted afterward make it clear that the federal government is dominant. By the early 1900s, the Supreme Court had begun to apply the guarantees in the Bill of Rights to the states, but it did so selectively and still has not applied all of those rights. The court, for example, decided that the right to a civil jury trial is only a federal right, not a right the states must honor. Two years ago, for the first time, the court ruled that the Second Amendment right to bear arms is an individual right, and not, as the court had long implied, a right guaranteed for military purposes. The 2008 decision invalidated a ban on handguns in the District of Columbia, but because the nation's capital is a federal enclave, the ruling applied only to federal laws. Now the court is hearing a challenge to a similar handgun ban in Chicago. And the question is whether the Second Amendment also applies to state and local laws. The case was brought by Otis McDonald, a retired maintenance engineer, who grew up on a farm in Louisiana shooting rabbits and squirrels. McDonald says he now wants a handgun to fend off youngsters in his Chicago neighborhood, where he says his home has been broken into three times. "Old people like myself, if we don't have some kind of deterrent in our homes, youngsters are going to take anything they want to," McDonald said. Gun rights advocates contend that the Chicago handgun ban is unconstitutional, that the Supreme Court already has held that the right to bear arms is an individual and fundamental right, and that the Second Amendment limits apply to every jurisdiction in the nation. Former Bush administration Solicitor General Paul Clement will make that argument Tuesday on behalf of the National Rifle Association. "Given that Chicago probably is pretty similarly situated to the District of Columbia, should there be radically different constitutional law regimes in those two places?" Clement asked. "The question," he said, "is whether Chicago is going to be completely unlimited by the federal Constitution." Chicago Mayor Richard Daley's response is that the federal government is not responsible for the health and safety of the citizens of Chicago; the city is. And he notes that Congress is not exactly eager to allow guns onto its property. "So why is it you can't even go see a congressman with a gun?" he asked. "Why can't you carry a gun into a federal building?" We have a society of laws, the mayor said. "We don't have a society by guns. If you want to make a society by guns, then you arm everyone, and you do away with the police, and ... you have chaos." But McDonald's attorney, Alan Gura, counters that the Constitution protects individual rights, and that the right to bear arms is analogous to other rights the Supreme Court has applied to the states — like the freedom to speak, to worship, and the right to personal autonomy and security. "If you can buy contraceptives and that's your way of extending your personal security," Gura said, "then one must assume that the right to buy a handgun for defense purposes is also going to be secured as an aspect of liberty." Chicago's attorneys say the city allows individuals to have long guns in their homes, but not handguns because they are easily stolen and used by criminals, or fired accidentally (sometimes even by children) or on purpose in domestic violence situations. The city notes that 87 percent of violent crimes are committed with handguns, and it argues that especially in densely populated areas, handguns are far more of a danger than a defense. McDonald concedes he could legally have a shotgun at home, and that he knows how to use one — but, he says, it's inconvenient. "Why should I have to be inconvenienced because of laws that are here to protect me?" he asked. Gura adds that the right to bear arms is, like other constitutional rights, not a matter of dealer's choice. The right to worship, he says, doesn't mean that you have "to choose from a select menu that's offered to you by the government. And likewise, with arms, if you have an arm, which is the kind that people would want to have for self-defense, then that arm cannot be banned entirely." Representing Chicago, lawyer Jim Feldman will tell the Supreme Court that there is no absolute right of self-defense. "If there were a free-floating right of self-defense," he said, "then you would have the right to a machine gun, or a bazooka, or who knows what else. If the claim is that your right to self-defense gives you the right to choose what kind of weapon you want to use, there would be no stopping point." Clement of the NRA says a bazooka is probably not even an arm "for purposes of the Second Amendment." But, he concedes, "A machine gun is a more difficult question." Benna Soloman, deputy corporation counsel for the city of Chicago, says that all the talk about the Second Amendment ignores the basic framework of the Constitution. "In addition to the provisions of the Bill of Rights," she said, "the founders created a government of states, within a federal system, and the prerogatives of state and local governments to enact regulations that they deem best for their local communities is actually a very important constitutional value." Clement, however, points to the Civil War and the constitutional amendments that followed, which changed that framework significantly. The 14th Amendment, he notes, made the federal Constitution applicable to the states in certain critical areas. "The whole point of Reconstruction was that some state and local experimentation had essentially caused a Civil War and was depriving people of their basic civil rights," Clement said. "And so the question in this case is: Is the Second Amendment essentially within the scope of those basic civil rights, or is it outside that core group of basic civil rights?" It is this clash that makes the McDonald case such a big deal, both philosophically and practically. As Clement frames the question, "Is the Second Amendment going to be this sort of oddball amendment that only applies in the District of Columbia and the national parks, or is this going to be an amendment that applies nationwide?" The odds are that gun advocates will win this case. The Supreme Court's groundbreaking 2008 decision was by a 5-4 vote, with conservatives in the majority. But now the question is whether a right declared fundamental by the court can be isolated as a federal right only — a proposition that liberals generally have not favored. And if gun advocates do win this case, expect a torrent of other cases, some already in the pipeline, that test a huge array of existing gun regulations — everything from laws banning concealed weapons to those banning the carrying of weapons in public without a permit, and laws that issue a carry permit only upon a showing of good cause or necessity. Then there are laws that limit the number of guns that can be purchased at one time; laws that ban assault weapons; laws that ban hunting rifles with optical sights in urban areas; laws that require guns to be trigger-locked or stored in a locked container — even a new California law that requires handguns to micro-stamp each cartridge when fired with the serial number of the gun. All of those laws could be in jeopardy, and more, depending on how the Supreme Court rules.